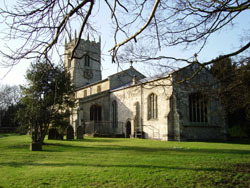 All Saints Church hosted a concert by the Lincolnshire Hospitals Brass Band on Saturday 2nd May 2009. The 30 strong band who are based at Lincoln County Hospital has built up an enviable reputation for their high standard of performances of well known and popular pieces of music from a variety of composers. The Band was directed by Sue Shorland ARCM who is Musical Arranger for the RAF College Band at Cranwell in addition to being their solo French Horn player. She was also responsible for the arrangement of the music played at the Passing Out Parade at the College at which Prince William received his "Wings". The Church was packed with around 140 people - not including the band and support members. The concert began with a rendition of the National Anthem. The audience were then treated to a first class performance of music with a selection of pieces to suit everyone, including 3 solo pieces, thoroughly enjoyed by all. The Lincolnshire Hospital Musicians, their Director and the support members came across as being a very happy team which showed in their performance. The concert ended with a prayer led by Reverend David Henson. Everyone was supplied with a prepared plate of homemade refreshments of sandwiches and cakes plus tea, coffee or fruit juice during the half time interval. This was the first big "test" of the new kitchen and toilet facilities provided by the new extension which worked very well. Catering for such a big event would have been impossible without the facilities. The evening was considered a great success and thanks go to all involved in the organising of the event. Around £650.00 was raised from the event for Church funds.